We are back into winter wonderland ski conditions here in the Adirondack Mountains. The 16+ inches of fresh powder went to good use today at Whiteface. Reports ranged from, "Sweet" to "Awesome but hard work," depending in the age of the reporter. Check out the powder slide show at the Whiteface Mountain website. Mount Van Hoevenberg is in stupendous shape - I had an evening ski there that would knock your sox off. And the backcountry is back and has some of the best skiing in years. I can't help it.....Skiing's great in New York State, especially in the Adirondacks! Big snow hits the Adirondacks! The weather-people got it all wrong this week and that is a good thing! We received about 16 inches of new snow in the last 24 hours. The Lake Placid Loppet will be held as scheduled and skiing everywhere is back to beautiful. I am certain to receive a Whiteface Mountain report this afternoon as I am working the morning shift at the Prudential Terry Horrocks real estate office. My guess is some of my colleagues are at the mountain conducting research for my blog. Today's photo was taken early this morning on Main Street in Lake Placid. 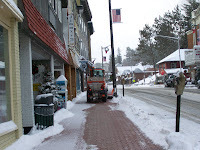 This is how we "shovel" sidewalks in mountain resorts!